Today we announce that ANSYS and SAP are partnering to deliver a significantly enhanced capability for predictive maintenance and operations of industrial assets. 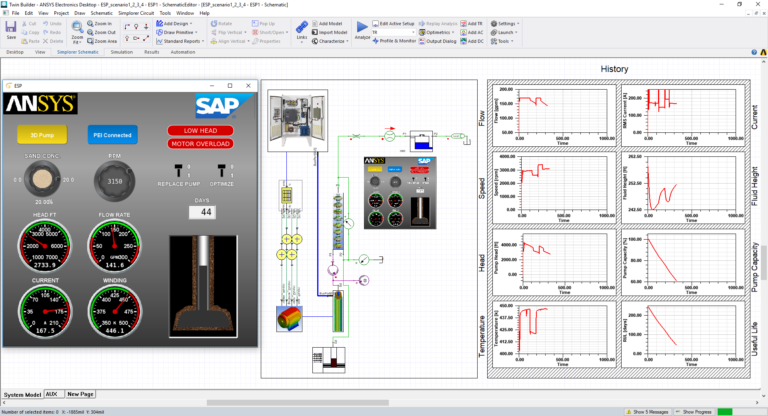 This solution, named SAP Predictive Engineering Insights Enabled by ANSYS, uses the full physics-based analysis capability of our just-released ANSYS Twin Builder product. This solution combines the power of SAP’s best-in-class Enterprise Asset Management capabilities with our best-in-class, industry-standard simulation capabilities for customers in oil and gas, energy, aerospace and defense, heavy-duty industrial systems and more. This combination provides customers with the ability to translate insights from simulation-based digital twins into actions that significantly improve maintenance and operational outcomes. When integrated with the SAP Enterprise Asset Management portfolio, including SAP Predictive Maintenance and Service and SAP Asset Intelligence Network, this solution will lead to pervasive benefits that span multiple functions for customers — including in operations, finance (due to maintenance and warranty savings) and product design. As an example, consider the case of an electrical submersible pump (ESP) used to pump tens of thousands of barrels of oil per day. Unplanned downtime for this ESP could cost millions of dollars per day and be caused by a failure to detect issues like wear due to sand. Simulation-augmented predictive maintenance schemes would better predict such service issues through digital inspection. Unplanned downtime can be significantly reduced by reducing production to a lower level and by ordering replacement parts. The benefits of this solution extend all the way to the boardroom, where customers will better understand the financial impact of reduced production versus the purchase of a new ESP or replacement parts. SAP Predictive Engineering Insights Enabled by ANSYS utilizes Twin Builder to build, validate and deploy digital twins. Twin Builder provides capabilities for quickly building accurate virtual prototypes of physical systems. To connect your digital twin to test data or real-time data, Twin Builder easily integrates with internet of things (IoT) platforms like SAP’s cloud-based solution and provides runtime deployment. These runtimes can easily be connected to the industrial assets throughout the field. Once connected, your digital twin can use the current state of your product to simulate future states, enabling you to predict when problems might occur. For operators, the availability of additional and more accurate insights into operations means significant improvements to maintenance and operations via continuous digital inspections. For engineers, the solution allows for operationalization of engineering knowledge via Twin Builder. Want to learn more about Twin Builder? Take a look at our new white paper, “Digital Twins: Making the Vision Achievable,” or learn more about the product’s capabilities on our website.